Jonathan Drouin didn’t want to sit out any longer. The 20-year-old forward returned to Syracuse Crunch practice on Tuesday, nearly two months after leaving the team on a game day in Toronto. 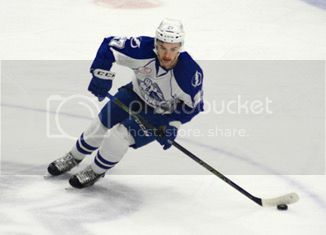 After Drouin’s trade demand went public in January, he was assigned to the Crunch and played seven games before heading home to await a move. Not dealt by the NHL trade deadline, Drouin just wants to get back to playing hockey. Jonathan Drouin wants to put the focus back on hockey. Three days after being assigned to the Syracuse Crunch, the 20-year-old forward refused to comment on his agent Allan Walsh going public with a request to be traded from the Tampa Bay Lightning. Drouin is finally feeling 100 percent and ready to play hockey -- wherever that is. Tampa Bay whips New York at its own game. Ben Bishop stopped all 26 shots he faced behind a masterful defensive effort to get the shutout. He was challenged pretty hard by the talking heads in the media after allowing 10 goals total in the previous two games of the series, and he smothered what few chances the Rangers developed tonight. He was especially strong in the First Period as the Lightning played a classic road strategy where they successfully weathered the home club's early charge. In the end, U of Maine Justice reigned supreme, and were I a superstitious man I might be advocating having Nesterov hit Bishop in the tender bits during warm-ups before every game from here on out if that's the performance you end up getting out of it. Steven Stamkos, Bishop, and Valtteri Filppula were the game's three stars. I am absolutely shocked at this result. Not so much that the Lightning won, mind you, but how they won was absolutely amazing. The Lightning essentially followed the Rangers' own recipe and baked up a sweet confection filled with defensive dominance. The Lightning typically do not play well without the puck. They are a possession team and they have looked lost for most of the past couple of years in games where the other team tilts the ice against them. Tonight, playing against an amped up Rangers team fresh off a 5-1 win on their home ice in MSG, they played a nearly flawless, defense-first road game where they comfortably absorbed the Rangers' pushes and eventually manufactured the goals they needed on a counter rush and late on the power play. At the heart of it all was a Herculean effort by the team's much-maligned penalty kill, which went 4-for-4 tonight and made the Rangers look positively non-threatening on their last 3 chances with the extra man. These are things I'm fairly certain the Lightning were not constructed for, and yet they executed that style with amazing efficiency. And, once they had that 2-goal lead, they put the lid on in the Third Period with a calmness they absolutely failed to muster in their Game Three victory that ended up getting pushed to Overtime. So, I'll say this: If the Lightning continue to prove they can win games like this consistently when they don't have the lion's share of possession, I don't know how you can beat them in a 7-game series. They continue to shore up every major hole and weakness in their game little by little as these playoffs move along. Bad PK last year? Looked pretty good most of these playoffs. Non-existent power play all regular season? Now they're getting key goals at key times. Waiting on your franchise cornerstones (Stamkos and Hedman) to rise up and be the team's best players along with Bishop? Sure looked that way tonight. When you layer learning to play a strong defensive game without the puck and learning how to protect leads in tight games on top of that, they're on the verge of becoming positively terrifying to play against. And, imagine this: Vladislav Namestnikov, Jonathan Drouin, and Slater Koekkoek aren't even regular contributors to this team, yet. They'll be even more talented at this time next season. I won't throw the "dy" word out there quite yet, but you can see where this might be progressing. They haven't played their best hockey consistently yet, and yet they've still managed to put the veteran-laden President's Trophy winner on the ropes after disposing of the presumptive MVP netminder in the previous round and NHL royalty in the Red Wings in the opening series. It just shows how incredibly talented this team is. Now, here's another test for the Lightning. Much like the Montreal series, you don't want this game to go to a Game Seven in their barn. You don't want to step foot in New York again until next season. Now: finish them. Put the offensive jump from Game Four together with the defensive play from Game Five and the finishing from Game Two and Game Three and put the Rangers away. Do so, and the team punches its ticket for the Stanley Cup Finals. To paraphrase Tyler Johnson, how cool is that? Nikita Nesterov was +1 with 1 hit in 8:02, with his ice time limited in a tight game on the road with the team not holding last change. I have to say, I'm pleased how he's tightened up his game in the defensive zone after looking a little loose in that department in the Montreal series. He could be a monster in another year or two once he gets a full regular season in to develop further at the NHL level. Ben Bishop allowed 2 goals on 18 shots for the OT loss. It's a bitter pill to swallow, but I can't really fault Ben on either goal. That hurt bad. That hurt really bad. The Lightning absolutely dominated almost the entire game. They outshop St. Louis 31-17 in regulation, and the chances were about that lopsided. Elliot made about a half dozen sparkling saves for the Blues and the Lightning continued to sputter on the PP, going 0-for-3 on the game. They just could not get the insurance marker and allowed the Blues to tie it off a clean faceoff loss by Brian Boyle, and in OT the defense just got out of sorts trying to stop a 2-on-2 rush situation, and in the end they left 1 point they should've gotten on the rink. Jonathan Drouin had a helper and was +1 with 1 hit in 15:42. He also set up Cedric Paquette with a long stretch pass in the Third Period that nearly became the key insurance marker, but Elliot stood up to the task. 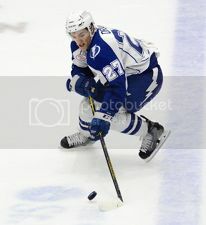 Tonight's game marks Drouin's graduation from prospect status on the website. Luke Witkowski was +1 with 1 hit and 2 blocked shots in 14:20. He plays like a guy who understands his athletic limitations and plays efficiently within his boundaries. He moves the puck quickly to make sure he doesn't put himself in bad spots. He'll give a guy a pop if its there, but he won't go running out of position to do it because he knows he doesn't necessarily have the recovery speed to get away with it. He's just played like a smart, lower pair stay-at-homer so far.